Rate this Article Virtual Reality has become one of the most popular emerging computer technology with the most potential. However, the drawback of isolating the user from the real world posses as a detriment to the human connection factor. To alleviate this, the need for more social interaction would be a necessity for the technology to succeed. One of the most innovative developments in the world of computing technology is Virtual Reality or VR. The concept has been around since 1933 when first introduced in the story "The Man Who Awoke" written by author Laurence Manning. However, it has only been brought to tangible and accessible reality in the past few years. The process of placing oneself in an alternate world and simulating it with the use of computers has opened up the doors to a myriad of applications where the technology could be and is currently being put to good use. Today, the application of Virtual Reality spans diverse fields of endeavor which include Engineering, Science, Medicine, Business, Education, Communication, Arts and Entertainment among others. The ability to experience simulated environments of real or fictional locations while physically being located at a distant or remote location empowers people to be able to perform tasks beyond that of which they can normally do. With VR, you can place a representative or avatar of yourself in an alternate environment where you can accomplish or perform activities which are not only hindered by physical factors such a distance of location but by certain physical disabilities as well. People who are disabled or sick can still be able to do such things as attend meetings and conferences, participate in virtual simulations or simply communicate with other people through the virtual world. Despite all these possibilities, if there is one negative aspect that VR has, it would be isolation. Once the user dons the VR headset, that's it, one is isolated from the real world. The VR environment that you are in cuts you off and the effects are greater than the computer-internet cultural isolation of the society we live in today. As it is, people are already isolated by spending most of their time with their phones, PC's and gadgets. Talking to someone over the phone or by video like Skype is not the same as talking to each other in person. The human factor is already greatly diminished that even in a crowded bus or train, people are staring at their phones instead of trying to start an innocent and friendly conversation with their fellowman. With the addition of VR devices at the hands of non-personal communicative humans, the tendency to loose real human contact becomes greater than ever. To prevent this from happening, many developers and manufacturers of VR technologies have started to push their devices and applications towards a more socially oriented environment. VR already isolates the user from the get go and even if there is any interaction whatsoever be it with AI NPC's or other user's avatars, the VR system as we have it today still lacks the massive social interface options that current internet sites like FaceBook, Tweeter, You Tube and other Social Media outlets have. To begin with, they still don't have the crowd. The potential of VR as a social medium or tool is huge as it can provide a more personal touch by simulating an environment as close as possible to personal physical face-to-face communications. It's not like you meet your friend at a real quaint cafe and spend the time chatting and drinking coffee or go to a bar where you can literally drown yourself in booze while chatting with the attractive drunk beside you. 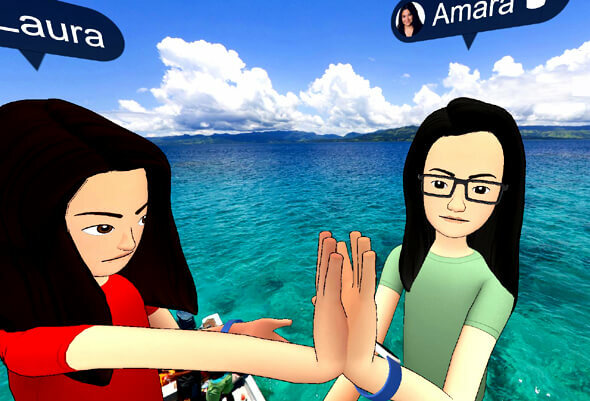 With VR you have your avatar that meets other peoples avatar where facial expressions, body movements and simulated physical contact like tapping or shaking hands can provide a more realistic experience than staring at each other through a web cam or your phone camera. If the VR experience would be able to provide massive experiences like these, VR would then be less isolating as it is today. The need to provide a more social and friendly environment is a must if VR is to succeed as a medium of technology and communication. As a crowd is needed to get the ball rolling, VR devices have to be at the point of affordability and availability to the masses. The cost of VR or getting into it is one of the major hindrances for getting it to be a resource of Social Media today. Another reason is the state of the technology where VR HMDs should be able to deliver visual quality that people can use for long periods of time without causing uncomfortable physical side effects to the user. With that solved and VR put to mass use, it would simply be natural progression for the massive VR Social Media sites to follow. Though developers are currently implementing multi-player games in VR and the main Social Media sites like FaceBook have started to implement VR rooms and spaces for social interaction, the amount of people with access to VR is still very limited to consider them as a viable crowd for social VR. People can go to arcades and play multi-player room VR games and interact with each other but only for very short periods of time. Many VR game oriented sites are currently sparsely populated and the need for more players and interaction is definitely there. The potential for the social use of VR is promising but until current VR and it's HMD's remain only for the few, socializing in VR will still no doubt be a limited affair.